BERLIN - There are just a handful of football teams left in the state that are undefeated, two of them being No. 9 Bloomfield (7-0) and 10th-ranked Berlin (7-0). But only one team will remain unbeaten after tonight. 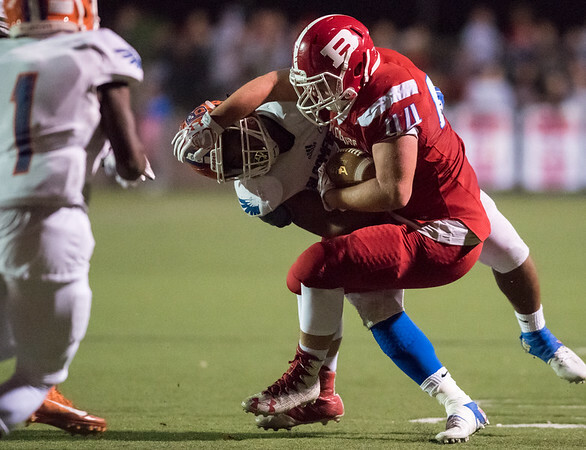 The two teams will square off in what will be Berlin’s second battle of unbeatens for the season at Bloomfield High School for a 7 p.m. kickoff. Berlin is currently the only team in Class M that is still undefeated, whereas in Class S there are five teams, which include the Warhawks, Ansonia, Woodland Regional, Bullard Havens and the Stafford/Somers/East Windsor co-op. Both teams, however, struggled with one common opponent this season, Northwest Catholic. The Redcoats and the Warhawks each posted their lowest scoring game of the season against the Eagles. For Berlin it was a 21-13 win and for the Warhawks it was 20-6. Like Northwest Catholic, Bloomfield will have numerous playmakers on the field tonight. Sophomore quarterback Daron Bryden has been well-known to football observers for years thanks to high-profile media exposure by his father, Craig. As a freshman last season, Bryden did not disappoint, throwing for 1,676 yards (67.3 completion percentage) and 19 touchdowns against eight interceptions. This year he has only improved, throwing 1,368 yards in seven games, completing 70 of his 101 attempts, with 24 touchdowns to just three interceptions. And those skill position players have made plenty of plays. Ky’Juon Butler is a four-year starter who played as a freshman on Bloomfield’s Class S championship team. Last season, he ran for 1,714 yards and 16 touchdowns. He also has 3,713 rushing yards and 33 TDs for his career. Butler is a dual threat, who also serves as the team’s leading linebacker last season, with 6.2 tackles per game, seven for a loss and an interception. In addition to Butler, the Warhawks also have junior receiver and tailback Anthony Simpson, who caught 40 passes for 646 yards and eight touchdowns and had 1,500 all-purpose yards, overall. Seniors Myles Davis and David Robinson and junior Mike Raiford will also be targets. Posted in New Britain Herald, Berlin on Thursday, 1 November 2018 21:18. Updated: Thursday, 1 November 2018 21:21.